Marantz AV7705 11.2Ch 4K Ultra HD AV Surround Pre-Amplifier Brand New. Now Selling At RM9,999. Free Shipping Within West Malaysia. Featuring 11.2 channel XLR and RCA pre-outs, the Marantz AV7705 supports all three-dimensional audio format Dolby Atmos, DTS:X, Auro-3D and DTS Virtual:X. For pristine picture quality, an advanced HDMI section supports 4K full-rate pass-through, 4:4:4 pure color, HDR and HDCP2.2. Enjoy audio playback with exceptional quality thanks to Marantz-proprietary HDAM modules and stream from Pandora, Spotify, TIDAL, Deezer and more with HEOS built-in. Ideal for custom integrations, the AV7705 features Creston Control and RS-232C serial port for third-party remote monitoring. Calibrate your listening environment with the full suite of Audyssey EQ tools and control the pre-amplifier with your voice and Amazon Alexa voice compatibility. 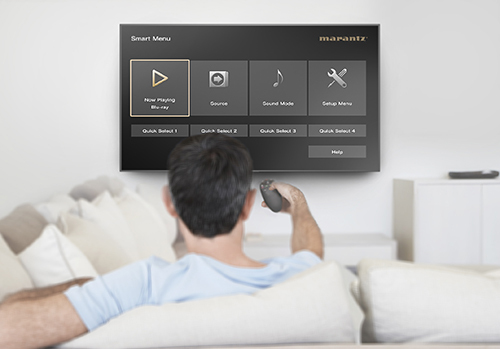 Marantz 2016 AVR remote app for control over the latest generation of Marantz network AV Receivers. Available on iOS and Android. 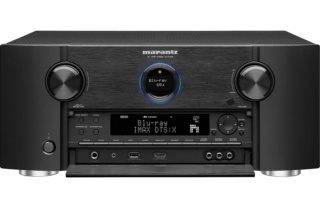 Experience a versatile home theater setup with the new Marantz AV7705 processor/pre-amplifier. Featuring 11.2 channel XLR and RCA pre-outs, the AV7705 is built for use with high-quality external power amplification or active speakers. Enjoy the audiophile sound you expect from Marantz combined with the latest video and audio decoding, as well as voice control with Amazon Alexa voice compatibility and Siri. With 11.2 channel pre-outs on both conventional RCA sockets and balanced XLRs, the AV7705 is designed to work alongside high-quality external power amplifiers like the Marantz MM8077, MM7055 and MM7025. Not only is it a superb AV processor, the AV7705 is an extraordinary analog preamplifier with an HDAM circuit board. 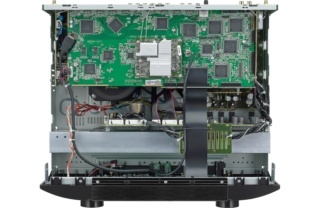 Using Marantz-proprietary HDAMs, the preamp section of the AV7705 provides optimal channel separation, minimum crosstalk and enhanced signal to noise ratio for precise detail resolution and stereo imaging, while the ELNA capacitators of the analog section ensure exceptional power and dynamic ability. Immerse yourself in multi-dimensional audio with Dolby Atmos, DTS:X, Auro-3D and DTS Virtual:X. Set up a Dolby Atmos surround sound speaker system up to 7.1.4 using Dolby Atmos elevation speakers or dedicated overhead speakers for the ultimate home theater experience. DTS:X™ immersive audio places sound where it would occur naturally in space, creating a lifelike, multi-dimensional audio experience in the home. The improved immersion and heightened realism draw you into the world of your favorite movies. The included DTS Neural:X™ gives your movies, games and music a realism unmatched by traditional 5.1 surround sound. Auro-3D® elevates the home theater experience with three-dimensional sound for music, games, broadcast and films which enhancing your existing audio-visual collection, thanks to Auromatic up-mixing engine. DTS Virtual:X provides immersive audio without height channels, creating virtual height effects in a 5.1, 7.1 or 2.1 speaker arrangement. Get the most premium at-home entertainment experience with IMAX Enhanced—the latest technology program from IMAX that sets a new standard for image, sound, scale and content quality. Watch clearer pictures and brighter images. Feel immersive, heart-pounding audio delivered by DTS. See more picture on the largest screens. And experience premium content digitally remastered by IMAX. Feel every dimension in Dolby Atmos. Enjoy a 7.1.4 surround sound speaker system with two or four additional overhead speakers or Dolby Atmos elevation speakers for the ultimate home theater experience — including Dolby Surround upmixer for legacy content. DTS:X immersive audio formatting places sound where it would naturally occur in space, creating life-like, multi-dimensional audio. The included spatial remapping engine of DTS Neural:X™ offers improved immersion and heightened realism in all of your favorite movies. DTS Virtual:X provides immersive audio without height channels, creating virtual height effects in a 5.1, 7.1 or 2.1 speaker arrangement. Includes eight HDMI inputs — with one HDMI input on the front panel for quick connection — each one supporting HDCP 2.2, 4K Ultra HD 60Hz video, 4:4:4 Pure Color sub-sampling, Dolby Vision, HLG, High Dynamic Range (HDR), 21:9 video, 3D and BT.2020 pass-through. The video processor is capable of upscaling SD and HD video to 4K Ultra HD. Three HDMI outputs allow you to connect to multiple zones as well as run a TV and projector in parallel. eARC (Enhanced Audio Return Channel) supports the transmission of 3D audio from your TV with a single HDMI connection for the simplest setup. The feature will be enabled via a future firmware update. Dual antenna system lets you stream the most popular music services via Bluetooth, AirPlay2 or the HEOS app. Listen to your playlists on Spotify, Pandora, TuneIn, Deezer and more. Built-in HEOS technology lets you enjoy your favorite music in any room of your home for a wireless, whole-home audio experience. Play the same song in every room or select a different song for each connected room — the choice is yours. Enjoy music from Spotify, TuneIn, Sound Cloud, Tidal, Napster, Deezer or your local music file libraries. With additional HEOS components, like HEOS-capable speakers, play all your music in one room or many. Enjoy hands-free control with Amazon Alexa and your voice. Adjust the volume, skip to the next track, switch inputs for your different media players and more — “Just Ask.” Download the HEOS Home Entertainment Skill to enable Amazon Alexa voice commands for the AV7705, HEOS devices and other select Marantz products. Stream audio from your favorite music services like Apple Music and Spotify or watch videos from services like Youtube and Netflix from any iPhone, iPad, Mac or Apple TV and hear the audio perfectly synced to your speakers Airplay 2 sources. Airplay 2 also supports multi-room audio – wirelessly stream content to multiple AirPlay 2 compatible devices simultaneously with improved audio buffering to ensure smooth audio playback. AirPlay 2 provides control and grouping of compatible audio devices within the Apple Music or Home app. Use Airplay 2 in-app or with your voice via Siri. Discover the incredible fidelity of high resolution audio tracks with the ability to decode up to 24-bit/192-kHz ALAC, FLAC and WAV lossless files as well as DSD 2.8MHz and 5.6MHz tracks (the audiophile format of SACD) via the front panel USB port and network sources. Or, listen to other popular file types such as MP3. For optimum fidelity and the widest dynamic range with lowest distortion, the AV7705 features advanced reference-class 32-bit AKM D/A converters on all channels. This ensures consistent high fidelity and precise channel matching across all channels for the ultimate listening experience. The Marantz 2016 AVR Remote app for iOS and Android gives you complete control over the latest Marantz network AV receivers. Use it to power on/off, adjust volume, input and settings, or switch instantly to the HEOS app. The AV7705 features exclusive Marantz Hyper Dynamic Amplifier Module (HDAM) technology that provide ultra-fast slew rate, true wideband performance and maximum dynamic range for optimum sound quality. Current Feedback technology, first introduced by Marantz more than 60 years ago, replaces voltage feedback configuration that’s typical of AV receivers and delivers wide, closed-loop bandwidth and steep slew rate for superior fidelity with wideband audio sources. The HDAM component of the Marantz AV7705 outperforms op-amp solutions due to its high speed and maintains a clean audio signal for exceptional sound performance. Equipped with the full Audyssey Platinum suite of advanced DSP algorithms, the AV7705 features Audyssey MultEQ XT32 automatic room acoustic correction. With the supplied measurement microphone, MultEQ XT32 analyzes each speaker's output (including the subwoofers) at up to 8 measurement locations and generates precision digital filters that optimize each channel for the correct frequency and time domain response. Audyssey Dynamic Volume smooths out disruptive jumps in volume (such as TV commercials), letting you listen at lower levels while still enjoying clear dialogue, music and sound. Audyssey Dynamic EQ provides full-range clarity at any listening level, and Audyssey Low Frequency Containment uses advanced psychoacoustic algorithms to deliver a full-range balance, including deep bass, without disturbing neighbors or people in other rooms of your home. Audyssey Sub EQ HT provides individual DSP tailoring of each subwoofer in a dual subwoofer setup for deeper bass with improved definition. Plus, the Audyssey MultEQ Editor app lets you view and adjust settings for detailed tuning and customize the sound more precisely to your room and tastes. Ideal for custom installs and remote troubleshooting. The AV7705 has a range of features to provide enhanced control and compatibility with third-party and custom integration solutions, including IP control, either via wired LAN connection or Wi-Fi. For compatibility with other components, use the remote-control input and output on the rear panel, along with a flasher input and a 12V trigger output. For direct connection to external home automation and control equipment, an RS-232C serial port provides remote monitoring. The AV7705 also features Crestron Connected for quick and easy integration with home automation equipment. Watch a movie in one room while another family member listens to a CD in a different zone without interruption. Enjoy 7.1-channel surround sound in the main room and a separate source or music stream in another. Surround yourself with even, accurate bass. The AV7705 features two subwoofer outputs to smooth low frequencies and improve bass dispersion, avoiding peaks and audible dips. 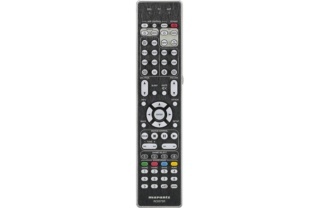 The Marantz AV7705 may be controlled with your Smart TV remote via the HDMI CEC functionality associated with your Smart TV. 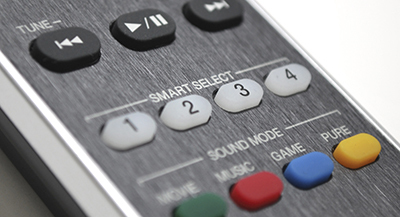 Simply set “HDMI Control” to ON in your receiver, then set “Smart Menu” to ON and begin controlling the AV7705 with your TV remote. The Smart Menu home screen provides you quick access to source and surround mode selections, the AVR's setup menu and four Smart Selects. The AV7705 features a front panel with four Smart Select buttons that store your preferred setup for each source, including input, volume and Audyssey configuration. With each button, EQ settings will adjust to support television, Blu-ray, Internet radio and more. The AV7705 Quick Start Guide provides simple, direct instructions to get started. 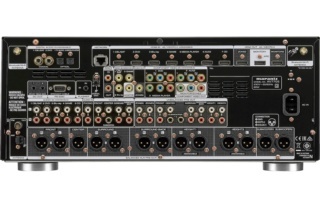 Once you connect your TV to the AV7705 via HDMI, the Marantz Setup Assistant appears on your TV screen and guides you through setup. The Setup Assistant helps you establish crucial settings for the best possible sound quality, whatever your configuration. All Marantz 2018 AVRs offer extended support for easy integration into custom installs. To support this effort, Marantz 2018 AVRs support “ihiji Invision” remote system management technology, “Domotz Pro” remote monitoring and management technology as well as offer a web interface to control and setup your AVR from a computer on the same network. The two first programs allow you to monitor the status of connected products and troubleshoot remotely from a sperate location or on the go. Founded in 1953, Marantz has a long and rich history of designing audio components embraced by music lovers and critical listeners around the world. Because Music Matters in your life, the AV7705 carries on the long tradition of delivering exceptional stereo listening, as well as the ultimate home theater experience. We buy in your old items in CASH!! Got something keep at home but seldom use or planning to upgrade? 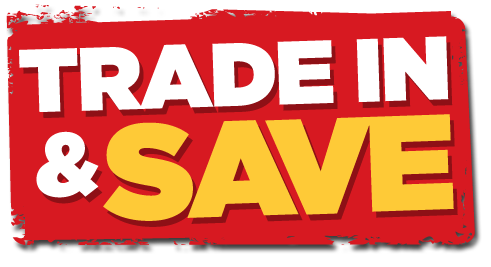 Please Whatsapp the item photo to me and get the price immediately, once confirmed the deal, we will pick up your item from you and pay you in cash. Please visit [You must be registered and logged in to see this link.] find out more products for sale at very special price..
» For Sale or Trade New Ofna Ultra MBX Comp "make offer" it needs to go!!!!! » MKIV : Ultra LInear or Triode ? » Triode/Ultralinear mode switch specs?